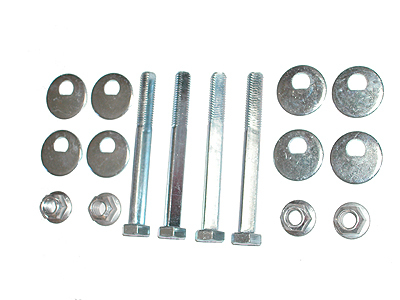 This kit is designed for the 2005-14 Frontier that is not equipped from the factory with alignment bolts. During production on the 2005 models, Nissan switched to straight bolts on all models. This kit will allow for an alignment with 2-3" of lift or even up to 5" of suspension lift. NISSAN DISCONTINUED FACTORY CAMBER BOLTS MIDWAY THROUGH THE 2005 PRODUCTION YEAR. FOR THIS REASON WE OFFER THEM TO ALLOW FOR A CORRECT FACTORY ALIGNMENT. THESE ARE REQUIRED FOR ALL LIFTED LATE MODEL NISSANS REGARDLESS OF THE MANUFACTURER OF THE FRONT END LIFT COMPONENTS.